← Big Data, The silver bullet ? For a computer scientist like me, the world of IT is such an exciting place! Since I started at university, I have seen the creation of companies like Amazon and Google, and later Netflix. They were for sure lucky to be in the right place at the right time. But it was ingenuity that has kept them in the market. What they did is a long story, but what I find interesting is that they have taken large quantities of content and made it accessible to the masses. One of the advantages of being an internet business is the fact that you are not limited by physical walls like traditional shops and your list of products can be close to never ending. If a physical store was truly so vast, customers would struggle to find anything and simply get lost. They would probably go to the shop next door, which has fewer products and buy things that are not exactly what they wanted, but are easily accessible. Offering lots of content does not ensure success, not even if you have precisely what your users want. Often 20% of your content will produce 80% of your business, if you can match the rest of the 80% of the content with your users, you will have more happy users and more business. The problem of activating the last 80% of the content is called the long tail problem. A way to enhance the accessibility to the content for the users is to add a recommender system to you site. This can attempt to predict what your customers want and serve it to them. 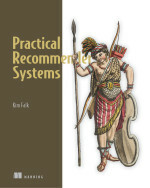 Implementation of Recommender systems is an intriguing task. The actual algorithms like collaborative or content-based filtering are just a small part of it. If you do not feed the algorithm with the right data, it will not produce anything worth looking at. Using user ratings will often not produce the results that users want. Looking at context is also often something worth thinking about. And when it is all implemented and running, how do you know that it is working, how do you measure improvements? Go and have a look, the first chapter is free!